For two years in my early 20s, I dated a man who was absolutely awful with money. Unfortunately, it took about 23 months too long to figure that part out. From a distance, he appeared to have his life together – he had his own apartment, a car that was paid off, and a job. Or so I thought. Unfortunately, I found the poor guy couldn’t balance his checkbook to save his life. And his credit was absolutely ruined, with tens of thousands of dollars of outstanding debt and collections agencies involved. Well, he quit at least six different jobs during the time we dated – mostly because he didn’t want to go, or because he had a bad day and didn’t really feel like going back. Eventually, I was to the point where I’d had enough. I was tired of worrying that he would stomp out of work like a toddler after an especially horrendous day, or that he would spend his rent money on dinners out with his friends. I was tired of arguing. I was tired of struggling. Fortunately, I listened and we broke up quickly after that, both moving on with our lives in drastically different ways. And even though it was traumatic, I was immediately relieved to have it all behind me. Just out of curiosity, though, I sometimes wonder how different my life would be had I stayed. Would I still be living paycheck to paycheck? Would we be broke? Would my credit eventually get ruined, too? I shudder at the thought of any of these outcomes, partly because I’m in such an amazing place personally and financially now, but also because I feel like I dodged the biggest bullet of my life. Because, with him, there would be no way I could have succeeded in life to the degree I have; and there is no way I would have a dollar to my name, either. Even worse, I would have missed out on life with my amazing husband and our two beautiful children. Thank goodness I had the sense to listen to my mother that day because she could see something I simply couldn’t. Unfortunately, not everyone gets the same warning I did. Valerie Rind, author of Gold Diggers and Deadbeat Dads: True Stories of Friends, Family, and Financial Ruin, is one who didn’t see the signs until it was too late. After blindly loaning money to her then-husband’s architectural firm back in the 90’s, Valerie found out that she was financing a slowly-sinking ship. Meanwhile, she also discovered secrets about his debts and assets. He even “hid the fact that he didn’t own the condo we lived in,” she says. But, by the time she found out, says Valerie, it was too late. “I lost my life savings, his business failed, and our marriage imploded,” she says. Valerie felt stupid, embarrassed, and ashamed, but ultimately parlayed her bad experience into new careers in personal finance and writing. And that was ultimately what led to her writing her book, which is full of the true stories of many individuals who have experienced financial ruin at the hands of lovers, spouses, family members and friends. Debt repayment could consume most of your expendable income. If your partner or spouse if an out-of-control spender, you could spend most of your working life paying down old or ongoing debts – or simply trying to keep up with new ones. “Your household finances will be affected if your partner carries a lot of debt and repayment is a big red line item in your budget,” says Valerie. You may found out their problems are worse than you thought. Similar to what happened to Valerie Rind, you may discover that your partner’s money secrets were worse than you thought. Because, when someone is really bad with money, sometimes anything goes. A good example would be a “person with a gambling addiction who is unlikely to change and may drag you down with them,” says Valerie. Do they have medical debt? Do they have past bankruptcies? What’s in their investment portfolio? What are their views on saving for college tuition vs. saving for retirement? Other details to find out can include whether or not your spouse is a saver, what their views on personal debts are, how much consumer debt they have currently, and whether or not they’re saving for retirement. At the same time, it’s important to also consider the context of your partner’s situation, says Rind. Not everyone in a bad financial situation plans to stay in one. For example, you might be involved with someone who made financial mistakes in the past but is slowly digging their way out. Perhaps they’ve learned from those bad experiences, and truly want to change. In the end, maybe the “wanting to change” part is the most important. It’s one thing for your potential spouse or partner to have made mistakes, but it’s an entirely different situation if they just don’t care. “You need to be fully aware of your fiancé’s past and present financial foibles and how their behavior may make your life together more challenging ­— or more rewarding,” she says. Even though we all need different amounts of money to be happy, most people would agree that no one wants to live a stressful life full of financial hardship. While it’s one thing to live on an average or less-than-average income, constantly struggling to make ends meet due to poor choices is an entirely different animal. From Valerie’s experience, and the experiences of others she shares in Gold Diggers and Deadbeat Dads, it appears the key is knowing all of the dirty details ahead of time. It’s true that marriage is “for better or for worse, for rich or for poor,” but it’s a whole lot easier when you know what you’re getting into. Medical debt is not the kind of debt that a person can always avoid. A friend of mine got stuck with a $30,000 surgery cost after an injury, and that was the reduced cost he bargained down. His insurance hadn’t started yet and the surgery was an immediate need. So I would disagree with the book author about having that kind of debt, as just having it isn’t necessarily a warning of a person’s financial-savvy-ness. I would probably agree with you there, although it depends how serious a person is taking it. If someone lets their medical debt go into collections and doesn’t care, that is really worrisome. But if they’re making payments and determined to get it taken care of, that’s a good sign. Personally, I care more about the fact that someone cares about their debt than how much debt they have! Greg had debt when we got married, but at least he understood what it was and what he needed to do about it. One day, I’ll actually share my story in long-form on my blog…but I absolutely married someone who was terrible with money. His family lived paycheck-to-paycheck and never prioritized savings. Thankfully, we dated for a looooooong time and also had a long engagement. We were able to iron some major issues out ahead of time, but it’s still something that we are constantly working at. I’d also be lying if I said it didn’t impact things like buying our house. Now, we approach things not through a lens of money but through the perspective of our goals. It’s less threatening that way and we’re both equally on board with achieving goals. Great post! I’m glad you worked it out! Yes there are people that were bad with money and eventually learned to manage it like, J.D. Roth from Money Boss and GRS. The person has to badly want to change. They just have to. It’s not hopeless and it can be done. They just better be ready to sweat and learn. I agree- you have to want to change! Sadly, many people don’t have the will or the desire. Great information! I was fortunate to marry a man with similar goals and views on money. Your mother’s advice was amazing – a simple statement that says so much! Hopefully I never have to say that to my children, but I intend to keep it in the back of my mind just in case. Thanks for sharing! I probably wouldn’t marry or date someone who was very irresponsible with money. But, that doesn’t mean I wouldn’t date or marry someone who is in debt. It just depends on what kind, how much, how and if they are responsibly paying it back, etc. I always default to what I heard on Oprah years ago, “when they show you who they are, believe them.” The only caveat is that I used to be not so great (not bad or super irresponsible), but just not great with money, and I changed a lot. But I would’t blame anyone for not being with me back then either. Ha! I wasn’t always an excellent money manager either. You live and you learn! Great post, Holly. I think part of the problem is that most couples do not go through pre-marital counseling these days. Financial matters are the number one cause of divorce for this exact reason, in my opinion. If more people considered financial deception to be a form of infidelity, a lot of the problems you mentioned would be eradicated. I agree! Life is also a lot easier when you’re on the same page about money. Excellent post Holly. I come at it from the other angle – I was the guy mired in debt and, completely, by my own doing and choices. Looking back, I wasn’t in the right place to truly be in any kind of serious relationship because we would’ve been in trouble from the start. I met Nicole when I was on the tail end of paying off my debt, I had about a year left on it, but I had completely changed my views on money and we both went into the relationship with confidence we were on the same page. A lot of that came from transparent communication and getting on the same page financially. Having transparency is huge, in my opinion, because otherwise you open yourself up to horrible situations or financial infidelity – neither of which is good. That being said, I think it depends on the situation and the person. If there is marked change going on then it’s possible but, if not, that can be a different story altogether and needs to be caught asap. I think it’s awesome you attacked your debt together! Oh my gosh, girl – I’m SO glad you moved on to better pastures!!! What a relief! It drives me nuts that Rick wants very little to do with our money management (childhood fears) but at least he’s more than willing to be thrifty and save money. 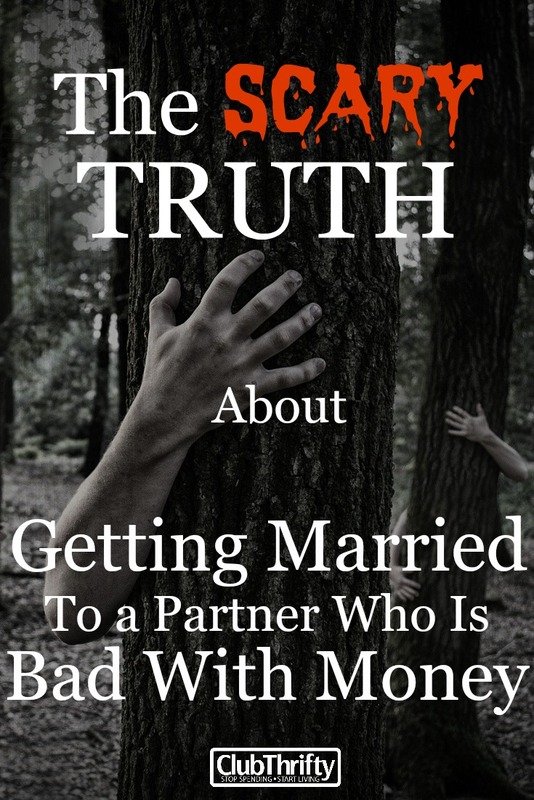 Marrying someone who is bad with money has a high likelihood of being a road to disaster, and I would advise anyone considering doing so to make a commitment to keep ALL monies separate forever – even mortgage and other debt. You don’t wanna go there. The email I received has Gregg Johnson being the author of the article and I was wondering about him being in a relationship with a man. Guess there’s nothing wrong with that. Ha! Yeah, I’m the author (Holly). We had to change that this morning. Sorry for any confusion! When growing up, my mom always told people my brother was so good with money, but I would always be broke. As we grew older, my brother and his wife were always broke (according to my mom it was the wife’s fault) but my husband and I built up a great retirement fund, paid for our son’s college through graduate school and more recently built a new home for cash. A co-worker and I were talking one day and I related this story to her, whereupon she said “does you mother even know you?” I’ve been frugal and a saver all the time, but I was willing to spend money on something important to me….always after the bills were paid. It\’s definitely important to have at least something of a handle on finances before you get into a relationship, because there are so many aspects of your life that you end up sharing that cost money. Emotionally difficult to write, but great post! I actually really agree with this! I married a guy who told me that he intentionally hid his debt from his family. Since he was also controlling and had to be over the finances, I always worried if he was hiding debt from me, too. But my other piece of advice is: can you have an open conversation about money, where the two of you are both contributors? My ex-husband would give me an allowance, but I was only allowed to spend my allowance on certain things. And most of my suggestions about our finances were ignored. If you can’t have open honest conversations about money, you’ll never be on the same page and are headed for disaster. I think it can work, but money is going to be the root of many arguments and disagreements. I also think you need to be on the same page as far as who has the final say, who holds the money, etc. I know some spenders out there with frugal spouses who make it work, but typically it means the frugal/responsible(?) one is the gatekeeper to the money. If you go into a relationship honestly and are willing to work together, that makes a ton of difference. If you understand there are differences between you and seek to find the best in each perspective, that helps. If you see debt as something to be avoided and share common goals, then the processes can be ironed out. It seems it’s not money exactly we get so bent out of shape over, it’s what’s behind it. So it may not be how much you have in the bank, but the idea of stability in your life. Protection, freedom, having enough for the kid’s needs. Constantly being on the edge is a scary hopeless place. Not being able to trust your spouse to care enough about the family, or to be honest with you, or to be selfish, or lazy, those are killers. Well, I married someone who was bad with money and in debt, but I also knew that going into things. His health problems kept him from working steadily. He’d work for a while, the stress would exacerbate his various issues, he’d start missing work and pretty quickly get fired. So he’d defaulted on his student loans. Since he figured he’d never be able to pay them off, he had a “Might as well spend it while I have it” mentality. Severe ADD didn’t help impulsivity, either. We got engaged quickly (really quickly — like 3 months in), so I assumed control of our finances and put us on a debt toward repayment of his student loans. It hasn’t been easy. There have been plenty of fights, or at least tense discussions, about spending. But he’s come a long way in tamping down impulse spending. It’s not gone completely. Nor are the tense discussions. Still, it’s a start. And I figured we’ve got a few decades together to keep working on it. There are some bloggers who write about how they were really bad with money and changed, so I think it’s possible, but I don’t think that’s a wise chance to take on someone you want to marry. It’s really not fair to the other person to marry them with an expectation that they will change the way you want them to. While it may sound heartless to consider money “over love,” ongoing money problems can somtimes point to deeper character issues that could make marriage a bad idea on multiple levels. Absolutely not. And if I was in the dating market today, having his money sorted would be my first filter/dealbreaker for me. It is really challenging to date someone who is bad at managing money or finances, but this area shouldn’t be sole basis to accept or reject a person. I’d give it a try and try to change her bad money habits.